B E S T R A T E S G U A R A N T E E D! We only have 3 Tented Suits at Ahaspokuna and fast filling. You may send your expression of interest or book instantly using our online booking engine. Ahaspokuna, located in Sri Lanka's hill country, is a novel experience for adventurers wishing to explore the best of what Sri Lanka has to offer. Only accessible by foot, this all-suite camp provides experiences that are all about bushwalks in an environment that provides new experiences around every corner. Enjoy Sri Lanka's famous warmth and hospitality at its finest and make your walking safari dreams come true. 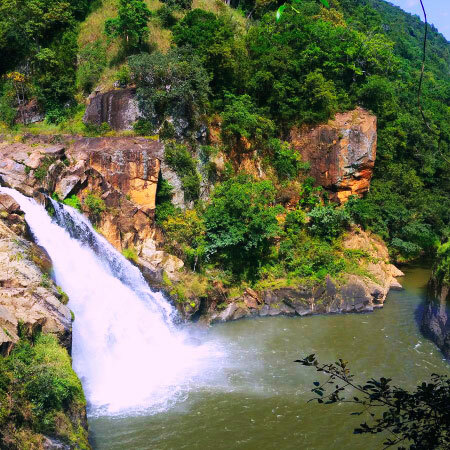 We are well connected from the upper mountains (Nuwara Eliya / Hatton) and Udawalwe / Yala National Parks are 2 to 3 hours away. Tangalle or Galle (Mirissa) could be connected to within 3 to 4 ½ hours. If you need to fly in, the closest fixed wing airport is just 2 to 2 ½ hours away. Helicopters could be landed very close to the site as well. In the Sinhalese language (spoken in Sri Lanka), “Ahas” means “Sky” and “Pokuna” means “Pond” or “Pool”. Ahaspokuna is so named in reference to the lake here, high up in the hills, that is only fed by rain water. A former settlement that sprung up on its shores was subsequently also named “Ahaspokuna”. Today, the jungle tide has washed over where people once lived and the camp provides a wilderness retreat for those in search of something different.